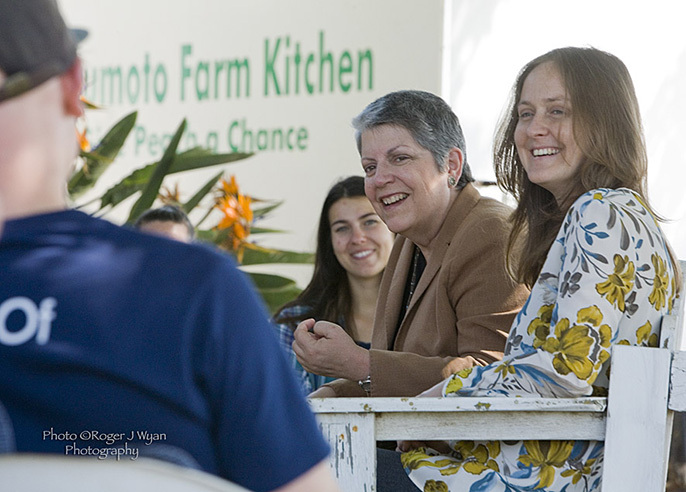 UC President Janet Napolitano listens to the first class of UC Global Food Initiative student fellows discuss their projects at Masumoto Family Farm in Del Rey. The University of California has selected its second class of Global Food Initiative fellows, students from around the UC system who will work on projects ranging from food access to policy to waste. The 44 fellows, representing all 10 UC campuses plus UC Agriculture and Natural Resources and Lawrence Berkeley National Laboratory, will help advance the systemwide initiative, which aims to put UC, the state and the world on a pathway to sustainably and nutritiously feed themselves. The $4,000 fellowships to undergraduate and graduate students, selected by the campuses, will fund student-generated research, projects or internships that support the initiative’s efforts to address food security, health and sustainability. Examples include projects to increase food recovery, advance food literacy, expand experiential learning opportunities in food systems and reduce greenhouse gas emissions through local sourcing of food. Based on feedback from last year’s fellows, one fellow from each campus this year will receive an additional $500 as student ambassador to help build campus engagement for the initiative. Ryan Dowdy, a second-time fellow from UC Davis who is working on a project to convert food waste into electricity to aid in the desalination process of sea water, said he is excited to interact with the new crop of fellows. UC leaders launched the Global Food Initiative last year. In April, the first class of GFI fellows toured an organic peach farm near Fresno. In July, they teamed with UC’s Carbon Neutrality Initiative fellows at a symposium to learn, network, build leadership skills and share information about their projects. A survey of the first class of GFI fellows found that 76 percent agreed the fellowship influenced their career plans and 96 percent agreed the fellowship exposed them to new ideas and concepts. Planned activities for the new fellows include an orientation, leadership training, spring field trip and joint summer symposium with Carbon Neutrality Initiative fellows. The bulk of the fellowship funding comes from the UC President’s Initiative Fund, with several campuses augmenting the funding to support additional student fellowships.